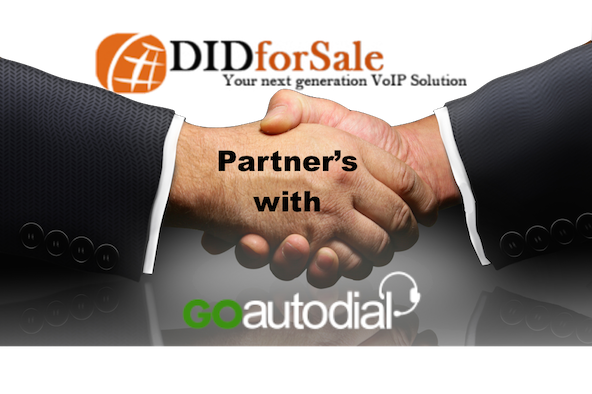 12th October, 2015: DIDForSale is pleased to announce a new partnership with GOautodial Inc., a leading cloud call center platform and open source system provider in the global market. As part of the expansion strategy in the international market, this is a landmark partnership that will provide unilateral benefits to SMEs that need cost effective call center platform, management, support, and other solutions. Based in Philippines with a North American office in Canada, GOautodial is widely acknowledged as the leading provider of cloud-managed call center platforms. The company has overseen exceptional growth in the past few years and is currently providing an array of solutions to clients in over 100 countries across the globe. Essentially built for SMEs, the open source system will now be integrated with DIDForSale’s leading SIP Trunking technology with largest coverage in North America that will provide cost effective solutions to businesses of all scales. With the new partnership, GOautodial Inc. will now be able to provide SIP Trunking and Local Phone numbers to clients in the US, UK and Canada. DIDForSale, a subsidiary of Cebod Technologies, has come a long way since 2007. SIP Trunking and open source call center platforms are still evolving technologies, and with the help of DIDForSale’s wide coverage, GOautodial, software call center industry can connect to consumer with improved one-stop trunking solutions..
DIDForSale is based in Southern California, USA and is a subsidiary of Cebod Technologies. With the largest coverage in USA, UK and Canada, the firm is a leading provider of SIP Trunking, Toll free, Local phone numbers and otherVoIP services to businesses across the world. For more Information contact DIDForSale at contact-info@didforsale.com and visit https://www.didforsale.com. GOautodial is a call center solutions provider based in Philippines, with a North American corporate headquarters in Quebec, Canada. With more than 50,000 customer downloads around the world, GOautodial is the small and medium enterprise (SME) owner’s top choice for a reliable yet inexpensive call center solution. For more information, contact GOautodial or visit www.goautodial.com. GOautodial North America Address: 922 Boulevard Decarie, Montreal, Quebec, H4L3M4, Canada.